McBeath Hardwoods sells prefinished panels in cherry, maple, red oak, walnut, zebrawood, bamboo and other species, some of which are available online. UV coatings have improved a lot in the last few years and, as shops face ever-increasing environmental issues, factory-coated panels are becoming more of a realistic option. Less in-house spraying means a lighter atmospheric footprint and prefinishing can often help with cost issues, too. 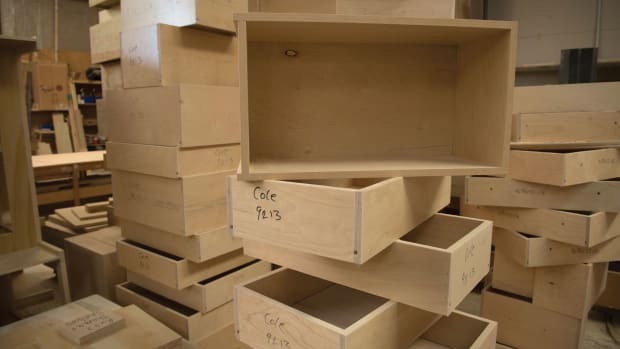 Almost any prefinished panel can be used in low-wear applications such as drawer boxes, shelves and cabinet sides and backs, and this is where the industry has concentrated so far. 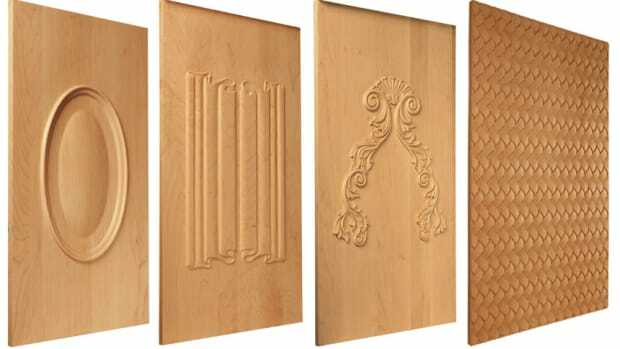 But prefinished panels can also be adapted to many architectural millwork applications such as coffered ceilings and site-built wainscoting, where the surfaces endure a lot less handling than they would as, say, casework door panels. However, some shops are using prefinished stock in hands-on applications such as appliance facing and even flat Shaker-style door panels. 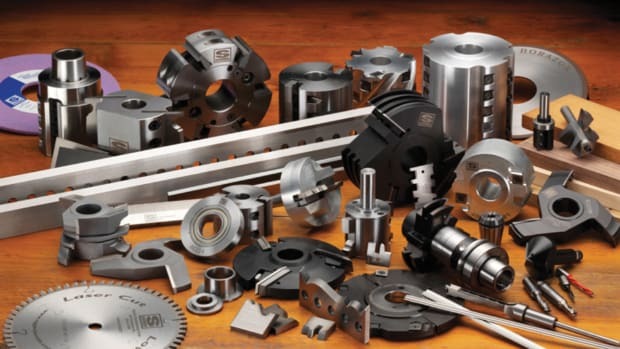 But in those applications, handling the stock can be a challenge: the UV coatings can scratch while being moved or machined and kerf lines from saw blades can tear out edges. Such blemishes are difficult or impossible to repair or touch up, so without very specific handling and machining protocols, the waste percentage can be quite high. Columbia Forest Products’ Finish Line includes UV Wood (right, a durable, VOC-free, UV-cured, clear top coat) and CustomColors (left) that delivers a custom-matched stain. Columbia Forest Products (columbiaforestproducts.com) has delivered more than 20 million prefinished panels to woodshops and casework manufacturers since 1996, making it one of the industry leaders in this sector. Columbia manufactures Finishline prefinished plywood in four options: UV Wood (durable, VOC-free, UV-cured, clear topcoat), UV LabCoat (a lab grade, chemical-resistant finish), CustomColors (with a custom-matched, 100 percent solids stain), and FirstStep (pre-primed, ready-to-paint panels). According to Columbia, its UV-cured prefinished panels reduce labor time, increase productivity and efficiency during the fabrication process and also prevent bottlenecks at the spray booth. Plus, the VOC-free product ensures there is no degradation of indoor air quality in the woodshop or the end-user’s building. A comprehensive sample box of available panels is available to architects, fabricators and other specifiers. States Industries (statesind.com) in Eugene, Ore., notes that its prefinished Nova panels are used primarily on interior vertical surfaces, such as cabinets, closets, fixtures and architectural interiors and particularly where finish consistency across a large number of panels is important. Customers can order Nova finishes on virtually any panels that are manufactured by States Industries and the surface options include clear, translucent and opaque versions. Custom gloss levels that resemble a woodshop’s in-house coating can be specified on volume orders and custom colors are available, too, although they require a prototyping process. The company’s finishes include Nova Peak, which is a set of stock color panels in popular species, and Nova Lab, a specialty finish with chemical-resistance properties that is SEFA-certified for laboratory use. Nova finishes are modified epoxy acrylate that is cured by ultraviolet light. 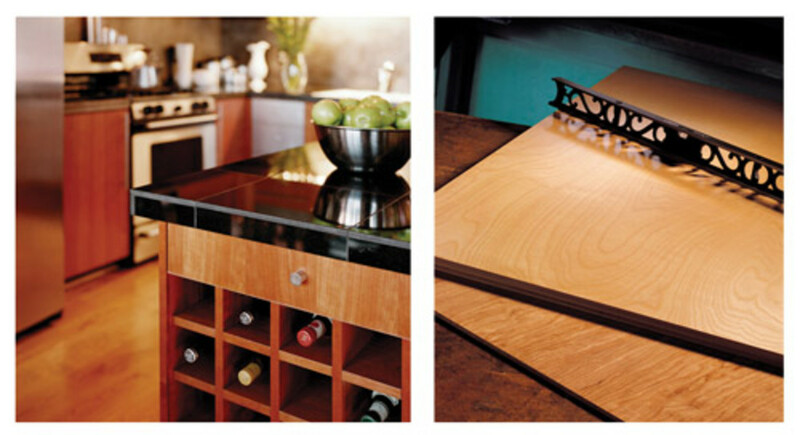 Timber Products Co. uses a flat-line finishing process that reduces material waste. 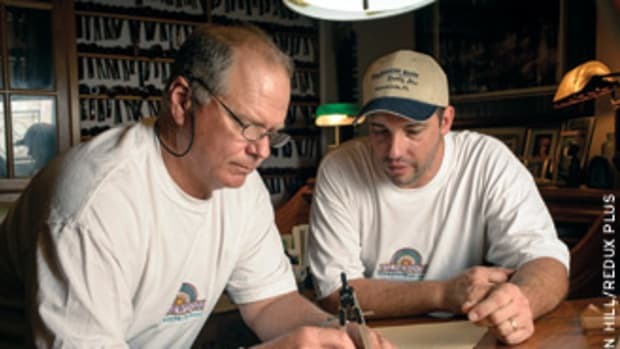 Timber Products Co. (timberproducts.com) in Springfield, Ore., offers prefinished hardwood panels through a network of distributors. 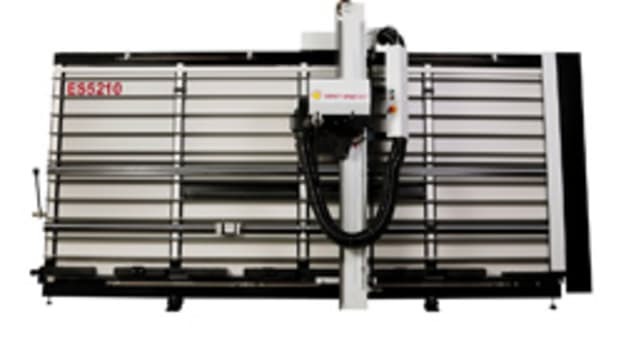 These panels, too, are designed to help woodshops achieve lower finishing costs and faster production times. The coating is applied using a specific UV curing technology, which the company says is one of the most environmentally conscious ways to finish a product: it contains no formaldehyde and no harmful volatile organic compounds (VOCs). Plus, the overall finishing cost for UV-cured panels is well below traditionally applied coatings. Timber Products uses a flat-line process that helps reduce waste by allowing excess finish to be recycled and reapplied. 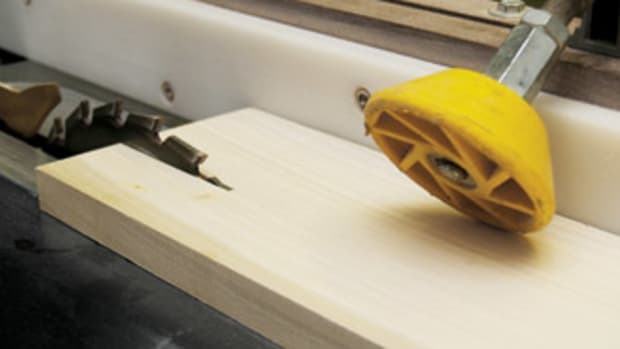 For the woodshop, there are cost advantages through improved production times and efficiency since the shop’s finishers can focus on more critical areas of production rather than spraying panels. Among other species, Crosscut Hardwoods’ prefinished walnut plywood has a durable clear finish that is stain and chemical resistant. Crosscut Hardwoods (crosscuthardwoods.com) has three locations in Washington and Oregon and offers a wide array of prefinished plywood panels including two-sided 3/4” walnut, plus one or two-sided, semigloss 1/4”, 1/2” and 3/4” birch and maple. Custom species include ash, beech, cherry, hickory, mahogany, red and white oak, and the topcoat process is a UV sealer and a double application of clear topcoat for a more durable finish. Roberts Plywood stocks prefinished decorative birch ply panels with colored translucent surfaces that are made by the Finnish company Koskisen. Roberts Plywood (roberts-plywood.com) in Deer Park, N.Y., stocks several species of prefinished plywood including sapele, cherry, walnut, oak and maple. For example, coated rotary cut maple is available in a 20 mil (20/1000”) veneer on a 48” x 96” plywood core, in 1/4”, 1/2”, 5/8”, 3/4” and 1” thicknesses. Many sheets offer one or two-sided coating and Roberts usually has a prefinished edge banding to match. Integra Doors (integradoors.com), based in Greer, S.C., offers powder-coated MDF panels, doors and moldings. The products are coated with epoxy powder that has an acrylic binder and then they are heated to make the powder gel and flow. That bonds it to the surface and completely seals the piece. Because the MDF accepts the epoxy electrostatically, the charged powder clings to the product and doesn’t come off. One of the biggest advantages to the process is that powder coating leaves a low carbon footprint. Prefinished panels mean that no VOCs or HAPs are being emitted, no glues or solvents are used in the coating process and all the powder that goes in the oven becomes the finish. Decotone Surfaces (decotonesurfaces.com) has locations in California, New Jersey and Ontario. 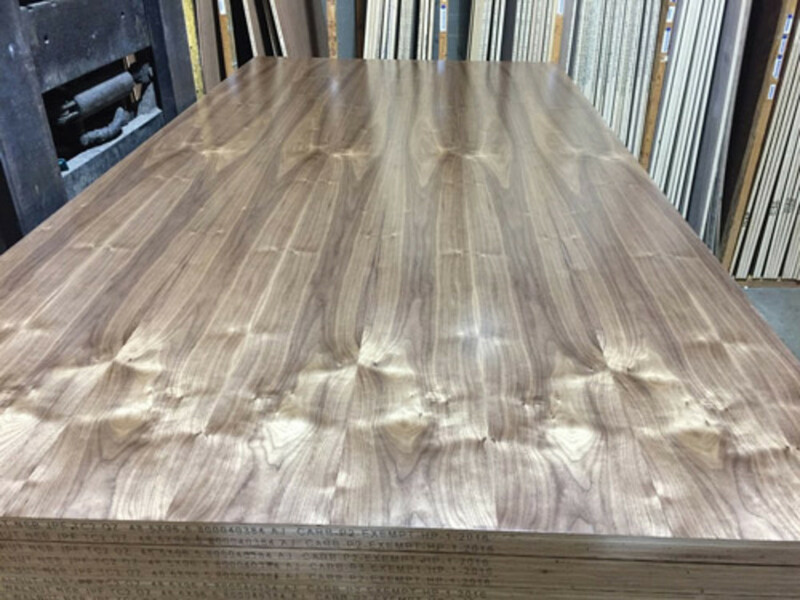 For woodshops that want to bring in a prefinished veneer sheet and laminate it to a plywood, MDF, HDF or particleboard substrate in-house, the company offers 4’x8’ sheets in several species such as oak, spruce, wenge, zebrawood and walnut. There’s a three-week lead time on some species and the company will provide a free sample. The sheets are composed of a layer of sliced natural wood veneer or reconstituted composite, backed with phenolic impregnated Kraft paper, available in several finishes including semi and full gloss. 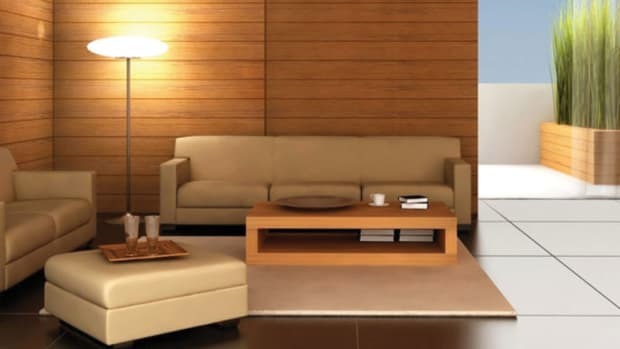 Construction Specialties (c-sgroup.com) in Lebanon, N.J. offers Renaissance brand real wood custom wall panels in sizes up to 4’ x 8’ and in a variety of species (cherry, ash, maple, oak, beech and bamboo), with five stain options and a choice of finishes. For small shops, most lumberyards can special order prefinished panels in less than bunk quantities. For example, Highland Hardwoods (highlandhardwoods.com) in Brentwood, N.H., will order in prefinished maple plywood on request. Edensaw Woods, Ltd (edensaw.com) in Port Townsend, Wash., offers a large selection of prefinished plywood in a number of species and thicknesses. It carries birch, cherry and maple options that are available as single sheets or in bulk, and specializes in custom orders. The company’s delivery trucks serve the Puget Sound region directly from Port Townsend and Seattle facilities and Edensaw also ships by rail, ocean barge and truck. In California, McBeath Hardwoods (macbeath.com) offers prefinished walnut plywood at its San Francisco and Berkeley stores and also sells quarter sheets (24” x 48”) online. The company also has stores in Utah and Indiana. 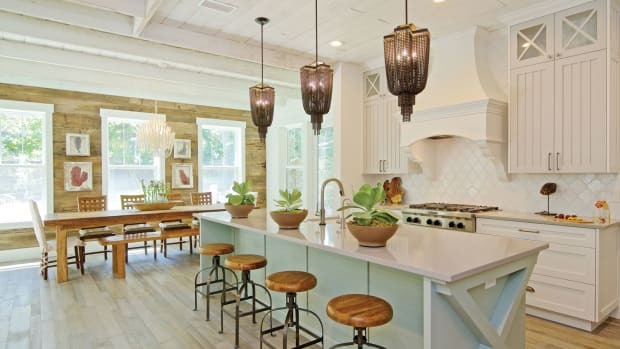 And CalPanel (calpanel.com), based in Cerritos, Calif., offers birch, maple and Baltic birch prefinished hardwood panels in stock, while other species are available on request. Whittelsey Wood Products (whittelseywood.com) stocks one of the largest and most diverse inventories of plywood in Florida, including prefinished maple panels in a 30 percent gloss UV coating. 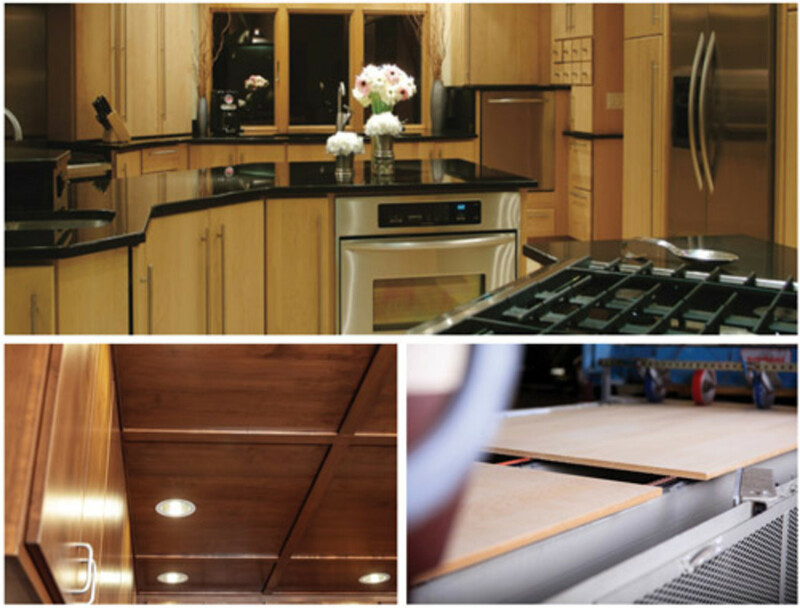 One final thought: a prefinished panel doesn’t have to be a natural veneer with a coating. Several manufacturers offer realistic laminate-coated MDF and the color and grain choices have come a long way in the last few years. 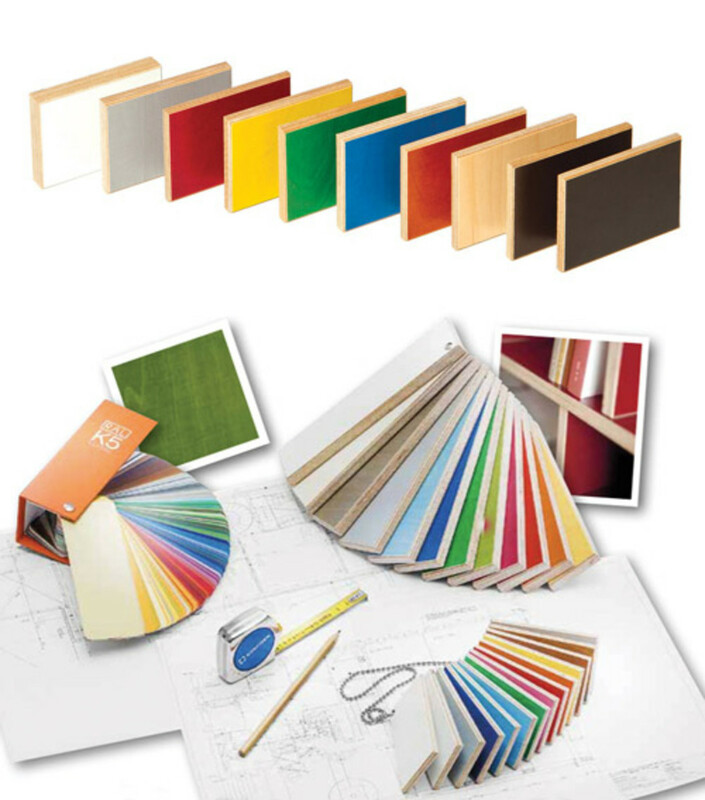 For example, Quebec-based Uniboard (uniboard.com) is one of the leading manufacturers of thermally-fused laminate panels (TFLs) and currently offers more than 120 colors in 11 finishes. Mother Nature might be challenged to match that.